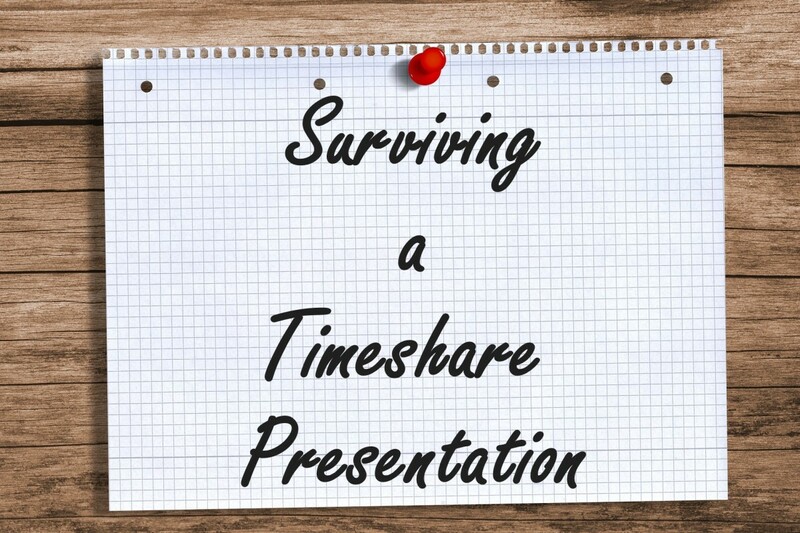 Liz and her husband have stayed in many hotels and like to share their experience to help fellow travellers make informed hotel choices. Our selection of Holiday Inn Express Porto Exponor was slightly unusual. Normally, travelers select a desirable location and then look around for hotels and travel options. We did the process in reverse; the choice of hotel dictated the destination. To be fair, having visited and enjoyed Portugal many times, Porto had come to our attention as a possible future destination. But what sealed this trip for us was the availability of the hotel at a very favorable points redemption rate through the IHG Rewards scheme. We set about looking into flight options before redeeming points and staying for free. Tip: Joining the InterContinental Hotel Group Rewards Club is free. Membership qualifies you for slightly reduced rates at IHG hotels. 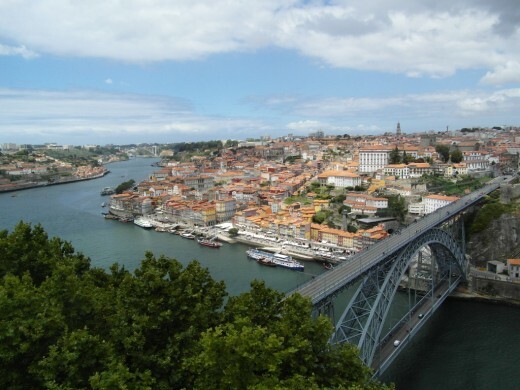 You can also collect points based on your stays, which can be redeemed against items in a catalog or used to book IHG hotels, as we did in Porto. No matter how thorough your research and how many reviews you have read, you never quite know what to expect when you arrive at a hotel for the first time. So it was with us when we took a taxi one Sunday morning in late June from Porto airport (Sa Carneiro), after an early morning flight from the UK, and arrived at Holiday Inn Express Porto Exponor. We passed a Pingu Doce supermarket (which we filed away for future reference) a short distance before we spied the familiar Holiday Inn Express logo along with the flags outside a distinctive modern building. It was set back a little from the road and the cobbled areas near the approach road gave the impression that this had been an area of redevelopment. Overall, the grassy areas and trees nearby added to the setting. There was parking available in front of the hotel and along a quiet road running parallel to the main road. The metallic grey exterior of the upper floors, with the regularly spaced bedroom windows, was supported by matching pillars. The high glass windows of the communal areas were set back a little behind these pillars. The building was never a contender for any architectural awards, but it had a clean and functional appearance. The initial interaction between hotel staff and guests at check-in can set the tone for the rest of the stay. A warm welcome goes a long way in creating a good impression. 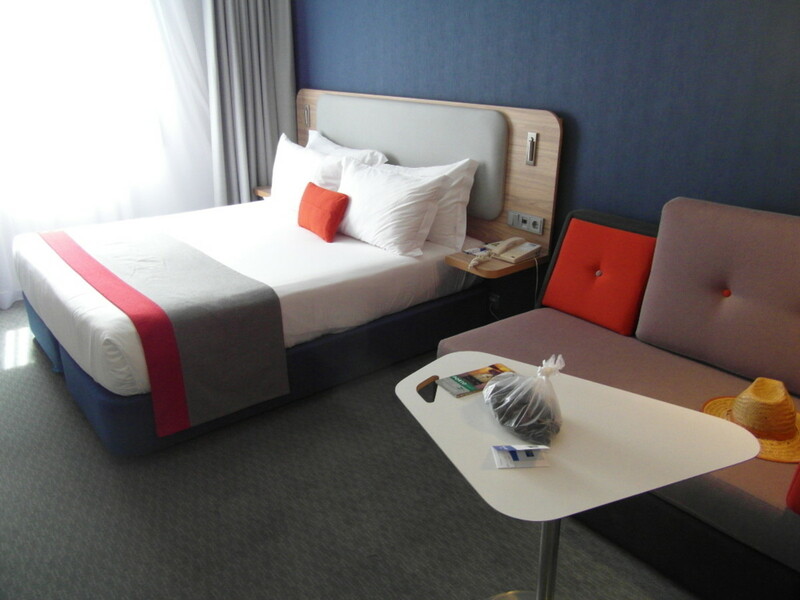 Our experience at the Holiday Inn Express Porto Exponor was slightly mixed. Admittedly we had thrown a spanner in the works by showing up at 10.30 am. It was a bit of a tall ask, especially on a Sunday morning when check-in was from 2.00pm and, understandably, there were no rooms ready for us, but we were offered storage for our luggage. I felt that the girl waited impatiently, while we sorted our bags. But another check-in staff member was much friendlier and suggested that we return at 12.00 - 12.30pm to see if a room was ready by then. We headed off to the local Pingu Doce, where we knew from past experience of the brand that we could pick up a coffee and something to eat at a very reasonable cost in the small cafe there. The location of this supermarket was also useful for buying drinks and snacks during our stay. We returned to the hotel by midday, as suggested. We had to wait a while and we've noticed previously how slow check-in can be in Portuguese hotels. The staff spoke reasonable English, which was helpful as our Portuguese is limited, to say the least. Copies of our passports were made. We were offered points (for the IHG Rewards Club) or a welcome drink. Tip: I cheekily ask now how many drinks the hotel is offering. Usually, it's one, but some offer two, in which case it's better value to take the drink vouchers and order the most expensive they will allow. If you're traveling as a couple, one drink is not a lot of help, as you'll feel obliged to spend out on another. We had requested a room on a high floor, away from the lift. In the event, we were on level 3 (of 5) and next door but one to the lift. Some you win, others you don't! On the plus side, I can say that we didn't notice the sound of the lift, nor of other hotel guests around us. Tip: Although on this occasion it didn't work, I would still recommend adding requests to your booking. Our experience has been that most IHG hotels try to comply with the wishes of their guests. If you can get a room on the top floor overlooking the front of the hotel, at the far end of the corridor, you might have a side view of Rio Leca and the ships docked there. The entrance to the hotel was to the right behind the pillars. As we entered, the long reception desk was facing us towards the back of the hotel. This part of the hotel had a lower ceiling to accommodate a corridor of guest rooms above. The reception desk, as is common in many Holiday Inn Express hotels ran on into the bar, so that reception staff can fulfill a dual role, serving drinks. To the right of the entrance was a small area of desks with computers and a printer. Beyond this were the lifts to the guest floors. There were also some toilets and the luggage storage room as well as a vending machine, a cigarette machine, microwave, ice dispenser and a rack of maps and leaflets. We also noticed a suitcase weighing machine for a euro. To the left of the entrance, there was a comfortable seating area with red sofas, brown and grey cushions, brown standard lamps and coffee tables. There were two olive trees in large off-white containers and a large flatscreen TV. There were also assorted miniature trees by the pillars. Beyond this was the dining area, with a large number of dark brown Formica topped square tables and chrome framed brown vinyl chairs. The lights in this area were interesting, as they were a mixture of prawn cracker effect shades and balloon lights. Tip: It's always worth having a look through maps and leaflets for inspiration on where to go and also for money off coupons on local attractions. Tip: To save money on excess baggage charges or paying for using scales in the hotel, you could invest in a battery powered digital suitcase weigher. (We find ours invaluable). Another cheaper option is to look out for an empty operational check-in desk at the airport, where you can cheekily weigh suitcases for free. Initial impressions of room 307 were that it felt small. It had pale grey walls to the left, facing the bed and contrasting blue walls behind the bed and backing onto the bathroom. As we entered, the bathroom door was to the right and an opaque tall window into it was set at an angle. To the left, there was a full-length mirror, slanted at an angle to accommodate a neat alcove behind it, with a hairdryer on a high shelf, iron, small water jug, and ironing board all stowed away neatly. 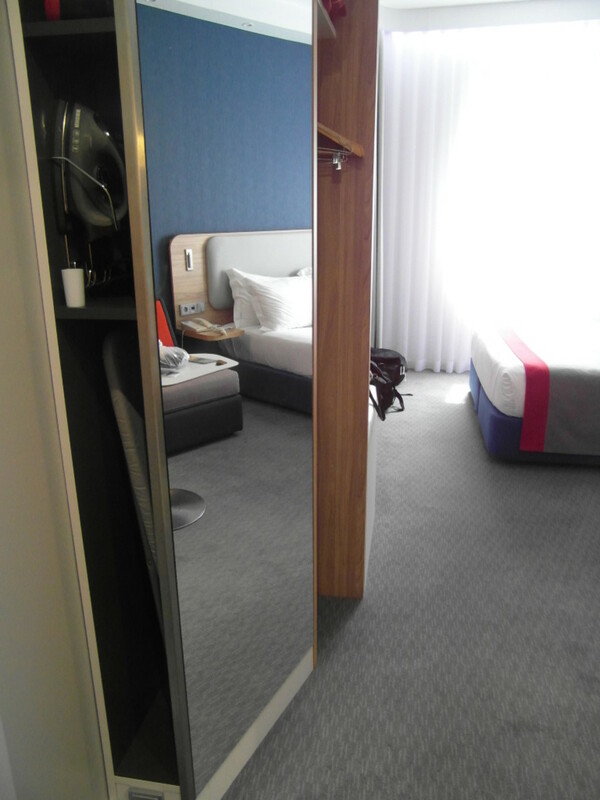 There was a useful plug socket at the base of the unit and a light in the ceiling, well-positioned for the mirror. Beyond the mirror, there was an open hanging area, with a medium effect wood finish. There were 4 wooden hooked hangers, 2 with clips and 2 metal hangers. There was an extra red blanket on a shelf above and a useful hook on the side of the wardrobe. Beyond this, there was a pale grey solid suitcase shelf, with a blue splashback attached to the wall behind it. There was a white shelf below and a chrome bin. Two decorative discs were mounted on the wall, one orange and one in a light wood to match the side of the wardrobe. In keeping with most hotels of this brand, Holiday Inn Express Porto Exponor, whilst being innovative in its use of space, was not great for storage. You can forget any thought of unpacking here. One of the compromises of choosing a limited service hotel is that you often find yourself living out of your suitcase! Opposite the bed, there was a large wood effect wall mounting with a large flatscreen TV attached. There was a narrow white shelf running below the TV with a bright red leaflet rack. It was okay for storing cans of drink, but not much else. The shelf widened towards the wardrobe, where there was a bright red kettle with two plug sockets. There was a small white tray, with two mugs, green tea, camomile tea, powdered milk, coffee (ordinary and decaffeinated), sweeteners and sugar. Tip: The tea and coffee making facilities go with the brand. Most Iberian hotel chains either do not provide a kettle or levy a charge for one. If a hot drink in your room is important to you it's always best to check ahead and, if necessary, consider taking a small travel kettle with you. Tip: We found that we could top up our drinks supply, by collecting teabags from the breakfast buffet (of which later). On the outside wall, there was a large rectangular window at waist-level. It opened from the side and had a restraint fitted. The view was far from scenic, looking out towards a high retaining wall, underground garage access road and a block of flats looming up above it. Full-length net curtains and full-length grey curtains, matching the two-tone grey carpet, ran along the wall and wrapped around the corner towards the TV. These were effective at cutting out daylight. The boxed area around the top of the curtains had lights mounted in it. The double bed had a deep blue base and a thick mattress. It had a white sheet, duvet, and pillows with the standard Holiday Inn Express pillow menu. There was also a small orange cushion and a grey runner across the bed with a red trim. A pale wood-effect headboard was attached to the wall, with a grey padded section behind the pillows. There was a moderate-sized shelf attached on each side, although one was occupied by a telephone. Each side had a plug socket and a flip out chrome reading light. There were also 4 lights positioned above the bed. Next to the bed, there was a 2 seater sofa with a dark grey base and brown cushion. The backrest was split between a large brown cushion with orange buttons and a smaller orange cushion with a brown button, matching the orange armrest. All the cushions were loose so that this could convert into a bed. There was a white-topped roughly triangular-shaped table on a circular chrome base. I found the table a little high for the sofa. It had a hole in the top, which would accommodate wires and there were two plug sockets in the nearby wall. Tip: When traveling be sure to take any necessary plug adaptors with you. There was a brown circular pouf/footrest with an orange side handle. There was a low slung, white-shaded lamp suspended from the ceiling on a red cord above the sofa. This posed a hazard for anyone of moderate height or above, who could hit their head on it. Controls for the air-conditioning were on the slanted wall by the opaque bathroom window. 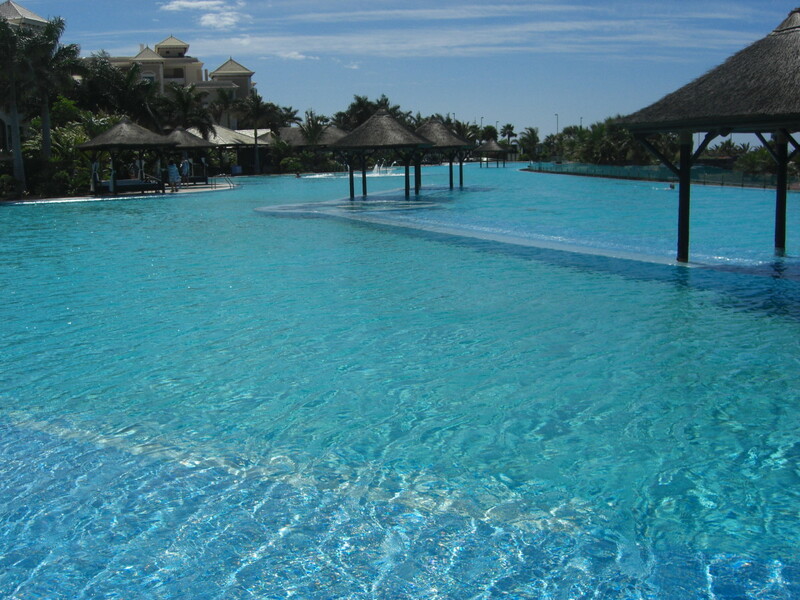 Tip: If you are looking for a hotel in a potentially warm climate, check that the rooms are air-conditioned. From experience, on a hot and humid night, fans do not 'cut it' for keeping the temperature down. Yes, you read the title right. We had a 'bathroom' in Holiday Inn Express Porto Exponor, as opposed to a shower room that every Holiday Inn Express I've stayed in in the UK, has had. The room was fully tiled, with large off-white floor tiles and shiny white wall tiles, with a row of small blue tiles between the sink and the mirror. A small circular white sink was inset into a curved deep black marble-effect top, which went up to the wall by the bath. There was a single, modern lift-action tap and a handy chrome ring towel-holder attached to the chrome side running the length of the marble top. Towel holders in handy locations, such as by the sink, are something that Holiday Inn Express is much better at than many higher star-rated brands. A liquid soap dispenser was mounted on the wall near the sink, with a chrome vertical tissue holder above it. A large rectangular mirror took up most of the wall behind the sink and I was surprised to see a small amount of rust in the corner of it. 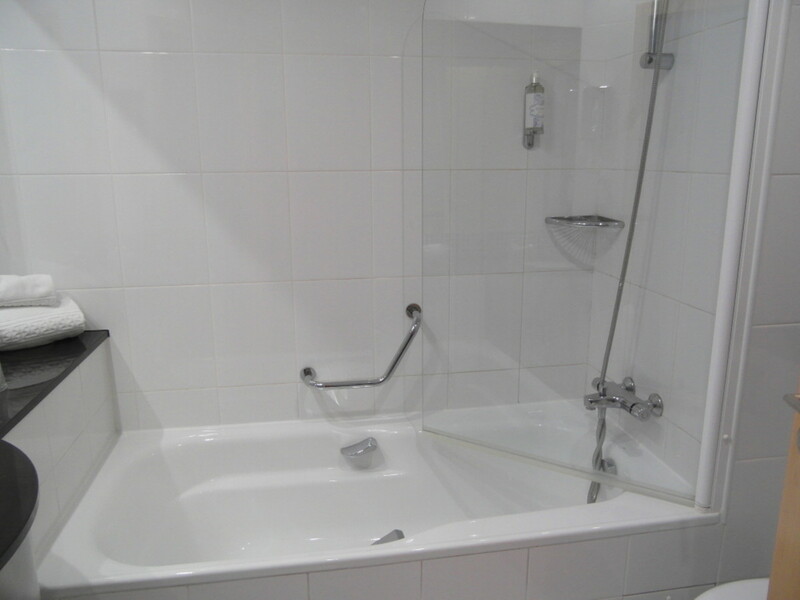 The white bath had a non-slip surface, chrome handles, and an additional wall-mounted grab rail. The mixer taps had a shower hose attachment linked to the high mounted shower head. There was a chrome corner rack for toiletries and a hair and body gel dispenser on the wall above. This was at a useful height for showering, but not so good for anyone sitting in the bath. There was a glass swing door screen half the bath length. Careful positioning of the shower head ensured that most of the water stayed in the bath area. A modern wall-mounted WC with a dual-flush control inset in chrome on the tiles behind was on the wall next to the bath. 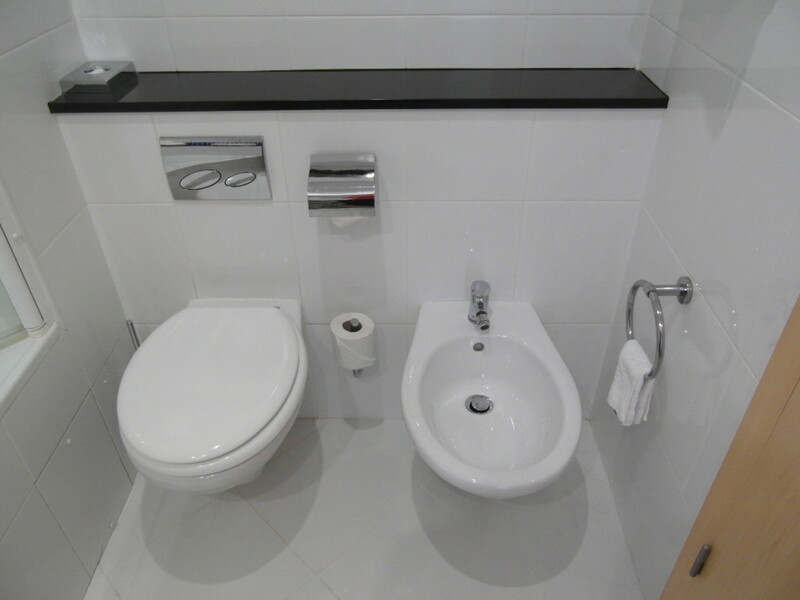 Two well-stocked toilet roll holders separated it from the obligatory bidet, often present in Iberian hotels and regarded with interest by Brits, as UK bathrooms don't have them. There was no shortage of places to hang towels in this bathroom, with a ring holder by the bidet, a towel rail mounted on the wall and a double chrome hook next to it. Along with towel storage, this Holiday Inn Express also excelled in bathroom lighting. Three bright lights were inset in the ceiling, as well as a blue nighttime light, an innovative feature, which ensures that visitors to the bathroom at night don't have to be fully woken by bright lights, nor do their partners trying to sleep. Overall impressions of the bathroom were very positive. It was modern, spotlessly clean, well-equipped and well-lit. One of the key advantages for me of staying in a Holiday Inn Express hotel is the 'free' breakfast buffet. Now we all know that 'free' is just another way of saying that it has been pre-paid inclusively in the room rate. But psychologically it works. For anyone expecting a fully loaded cooked breakfast, I should point out that a Holiday Inn Express breakfast has its limitations. It's more of a cold buffet with usually very few hot options, or in this case, no hot options at all. Nevertheless, it is possible to fill up, as we proved and this was one of the better Express buffets I have come across. 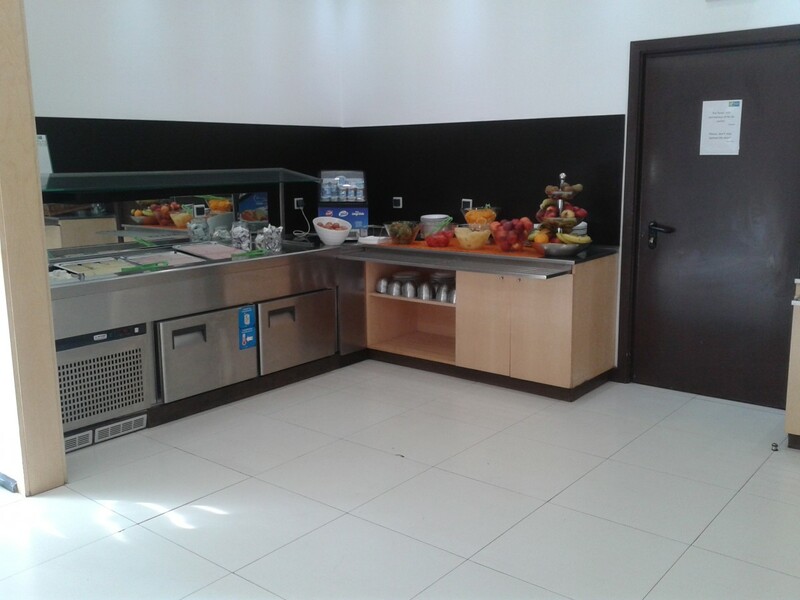 The breakfast servery was located in a partitioned area, which was opened up beyond the bar, along the back wall of the hotel. 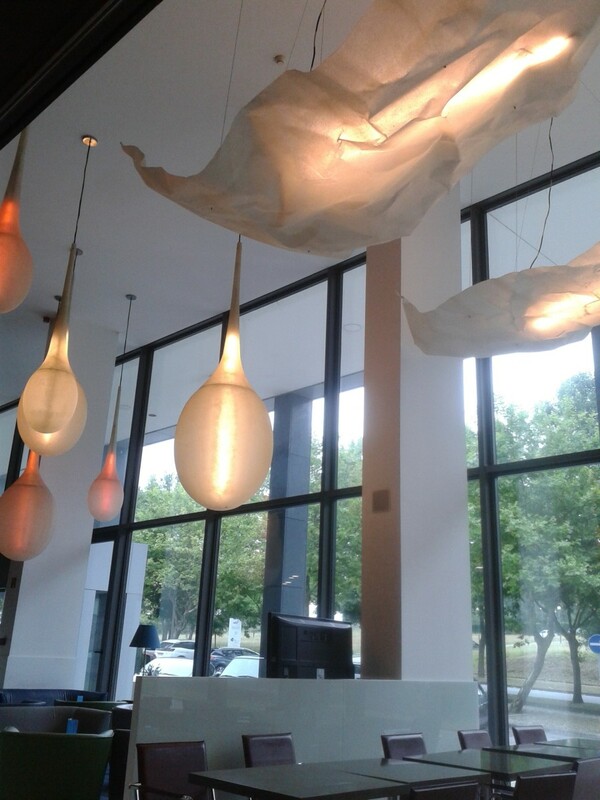 This had a lower ceiling than the dining area at the front of the hotel, but it had additional brown topped dining tables with low slung lamps above them. There was also access to an outside eating area, but we avoided this, as it tended to attract smokers and was in an enclosed concrete area between the back of the hotel and a high retaining wall and block of flats behind. 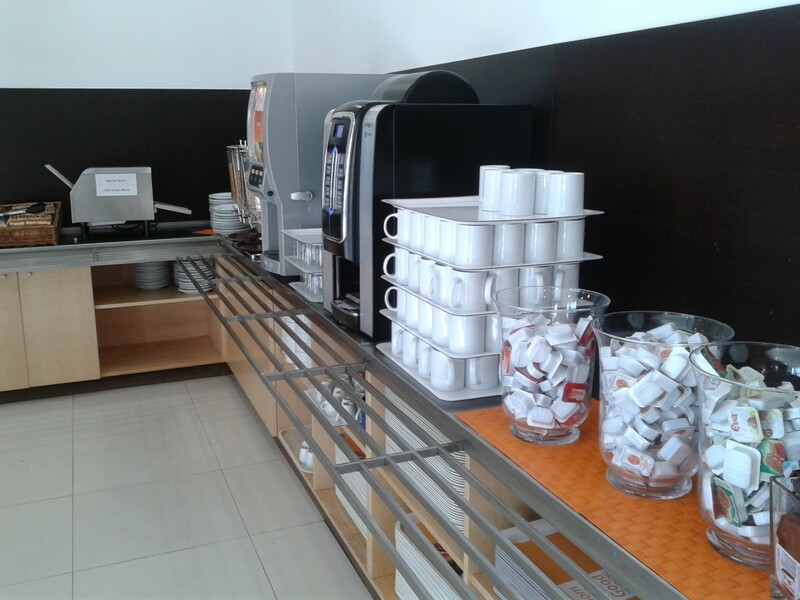 On the back wall, there were 2 hot drinks machines, serving various types of coffee, hot chocolate and hot water to go with the wide selection of tea bags. Mugs were stacked on trays, with spares on a shelf below the counter. There was a selection of sweet spreads in small plastic containers: honey, plum and strawberry jams. A cold drinks dispenser offered the choice of peach, orange or multifruit flavors, which had the taste and appearance of randomly diluted squash. Cereal dispensers churned out a choice of cornflakes, choco-flakes, Special K and muesli into bowls. There was a toaster with sliced bread and plates nearby. The display was interrupted by a door into the kitchen and then continued on a cold unit that stretched around the next corner of the room. A tiered stand held a wide selection of apples, pears. bananas, kiwi fruit, bananas, and nectarines. For anyone wanting to smuggle out fruit for later in the day, this was the place to go. Having an overactive conscience it's not something that I tend to do these days, but I have in the past and have often watched with amusement as some hotel guests blatantly load up their bags with fruit, or even make sandwiches for lunch in full view of the hotel staff, in spite of notices deterring such practices. There were also glass dishes of sliced kiwi, tinned pineapple slices, chunks of watermelon, sliced oranges and whole peaches. A small countertop fridge unit kept a selection of smooth yogurts cool. There was a cold cabinet with sliced ham, turkey ham, sliced cheese, margarine, butter, chunks of cream cheese and a cheese spread. There was a choice of skimmed or semi-skimmed milk. Nearby there was a tall tray rack for guests to place their trays of dirty crockery after use. This is a sensible time-saving device in a limited service hotel, where staff numbers are restricted, but a practice that has largely fallen into disuse in the UK. If you are thinking that the list of food options is complete, you're wrong. Tables were placed around a pillar and loaded up with a selection of bread rolls, pastries, some with chocolate inside, buttery croissants, pastel de nata (a Portuguese specialty like an egg custard tart, which I can highly recommend), chocolate and plain muffins. This was also the location of a range of cutlery and the paper napkins. Signage was in Portuguese and English, but we noticed that most posters on the wall were in English. What's your favorite board basis? Our kettle was faulty. The top flipped open with steam. It was replaced quickly by a staff member, who came with a white kettle on a bigger tray with two more mugs and a selection of drinks. On a few occasions, our keycard failed to work, which was slightly annoying after a long day sightseeing. Depending on who we got on reception, we sometimes were met with no apology or acknowledgment. After this happening 4 times, we complained and requested some points back, without much success. (Always worth a try though.) At times there's a lot to be said for the old-fashioned room key! During our time at Holiday Inn Express Porto Exponor, there was an under-18s basketball tournament taking place nearby. Gradually the hotel filled with several teams. We noticed Portugal, Belgium, Sweden, and France. Tables were placed together at breakfast and reserved with the team's flags. It was interesting as a study in national characteristics but could be challenging at breakfast if you hit the wrong time. One day was especially busy when several teams coincided and long queues formed for the hot drinks. We later noticed a timetable at reception, which one team, in particular, had blatantly ignored causing the traffic jam. 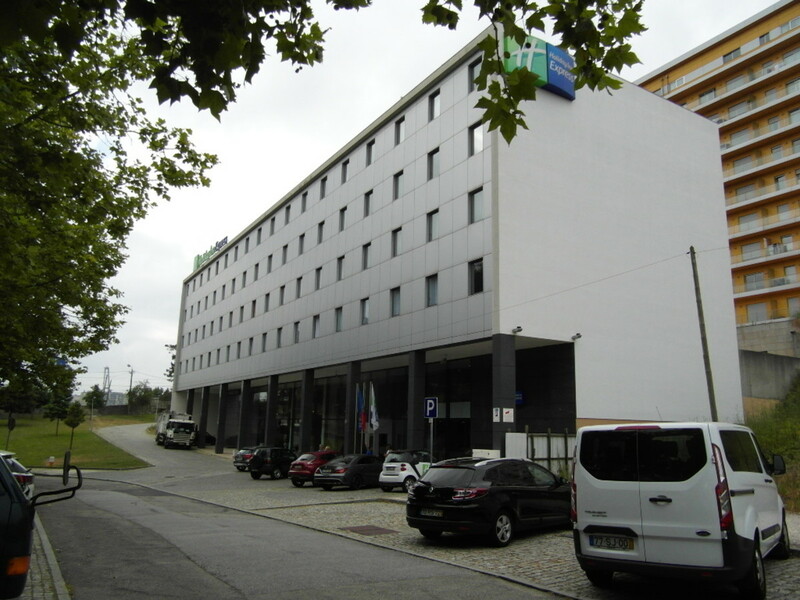 The hotel is 8.9 kilometers from Porto's Francisco Sa Carneiro Airport. On arrival, the journey took us 10-15 minutes and cost 15.30 Euros by taxi. By the end of our stay, we had mastered the transport network and took the 601 bus from opposite the front of the hotel, which took a little longer, but was much cheaper. In the opposite direction, the 601 from outside the hotel got us into the center of Porto (Cordoaria), 9.5 kilometers away, in 24 minutes at best and a little longer at rush hour. On one occasion, early in the morning, a taxi took us 15 minutes to get onto the Cais da Ribeira by the river and cost 16.40 Euros. The nearest beach, at Leca da Palmeira is a 1.8km walk away and the coastal saltwater swimming pools a further 200 meters. Matosinhos beach is 2.9km from Holiday Inn Express Porto Exponor. But if you are looking for a nearer location to take a dip, there is a municipal open-air swimming pool in Park Quinta da Conceicao, 500 meters from the hotel. I would rate Holiday Inn Express Porto Exponor overall very highly. 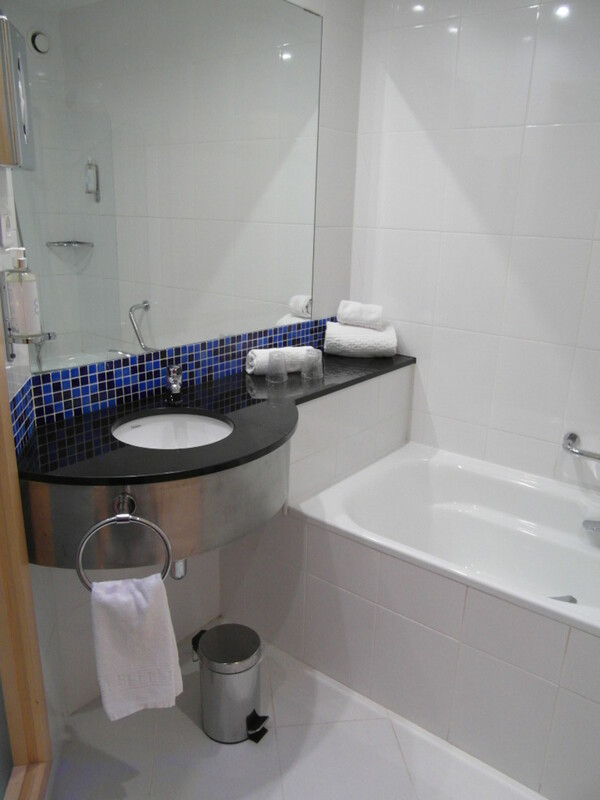 For a limited service hotel, the bedroom and bathroom were of a high standard. The breakfast buffet was excellent. Most staff members were polite and helpful, with the odd exception. For our purposes, the location worked well. Over the eleven night stay, we were able to have a mix of city sightseeing and local walks along the coast. If time is limited and you want to focus on a city break in Porto, you might want to consider hotels closer to the center. But these will come at a higher price. This hotel was a bargain buy for us, as we used IHG Rewards points to 'pay' for our room. I would recommend it. Good point, Robert. That's what hubs are all about, recounting stories and experiences. Maybe we'll get to hear the Corfu story sometime. Thanks for your comment, Nell. Where did you stay in Corfu? We were in Roda many years ago. I would like to return some time. Nell Rose, long stories make for good Hubs. I could have done with reading something like this when I went to Corfu, very long story! LOL! Thanks for the great information. Thanks for your comment, Linda. 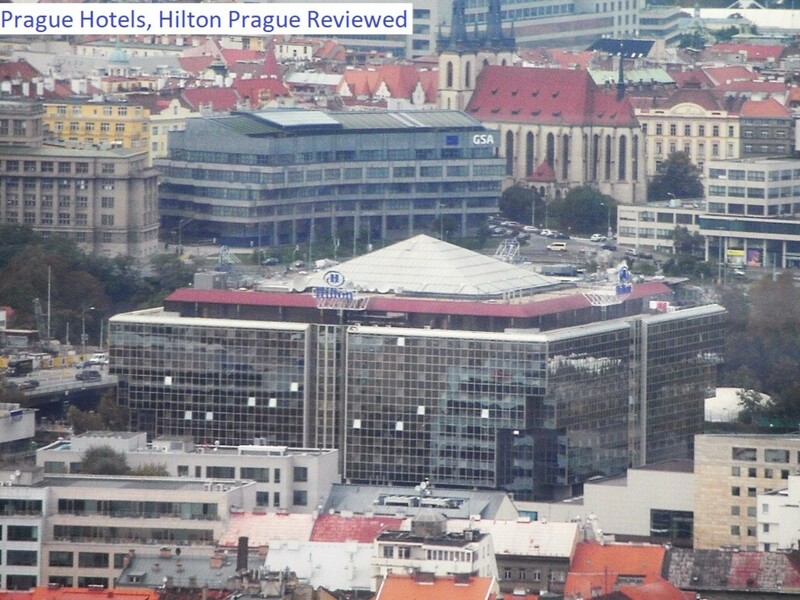 Holiday Inn Express hotels have spread across Europe the past 20+ years. They are affordable and reliable with their inclusive all you can eat breakfast. Great review of the Holiday Inn Express in Porto. It looks clean and modern. They are plenty comfortable and budget-friendly. I didn't know Holiday Inn hotels were scattered across the continent. That must have been a very big storm. If cost were no issue I would choose beachfront every time. Although, depending on the location, I guess some could be noisy at night. One of my most memorable stays was in Gibraltar. There was a beach to the side of the hotel, but our rooms looked directly over the sea. The downside was that on a stormy night, it was the noise of the sea, not revellers in bars, that kept us awake. We saw some great sunrises though. I remember when I first spent a night in a beachfront hotel. It is wonderful looking out at the ocean at night. Thanks for your comment, Kirti dv. I agree. I also like beachfront hotels. Holiday Inn Express Porto Exponor was not in a beachside location, but it was within walking distance. Looks very cozy and comfortable liz. And the fact that it's close to the beach is always a bonus. I love hotels close by or on the beach. Waking up to the smell of the ocean is so calming. Thanks for yoir comment, Paola. I started out writing hotel reviews on a British site. The feedback I got initially was that they weren't thorough enough. So I went to the othdr extreme and the thorough style of hotel review writing has stuck with me ever since. Wow, what a thorough review! I felt I was there in the hotel! From the pictures, I can see that the bathroom was really top notch, as you pointed out. Well done on joining the Hubpages community, by the way! I can completely understand your husband's viewpoint. Until recently we tended to use Holiday Inn Express hotels for brief stays, often near airports. It was the excellent points redemption rate, which tempted us on this occasion in Porto. I noticed another suitcase weigher in a hotel in Holland recently. It was charging 1 euro. We carry our own digital scale. You can never be too careful, especially with some of the budget airlines. Those excess baggage charges look quite expensive. First time I have heard of charging to weigh cases. Staying at our small hotel in Menorca all the guests simply borrow a digital scale from reception. Thank you. More good information. That's a difficult question. Our usual modus operandi once we have selected the location is to search for deals or see if we have any loyalty points we can use. Personally I like IHG and Hilton because you know what you are going to get roughly with their brand standards. Holiday Inn Express comes out well in the limited service/cheaper category and the breakfasts are usually good. Being at the lower end of the scale the prices tend to be ok, but this varies a lot depending on location and demand. Sometimes we can find a better quality hotel, like a Holiday Inn going cheaper than an Express. I think this is where the big price comparison sites come into their own to help find a good deal. Is there any chain that you think is the best buy for the money? Thank you for your comment, Robert. We stay in quite a few hotels and I like to give accurate feedback to help others who might stay. This is a very detailed article about the hotel. It has some good tips. The pictures give a good show of what a hotel room was like. Thanks for your comment, FlourishAnyway. We have also found that sometimes signing up for a branded credit card can result in hotel stay offers or points. It always feels better staying somewhere that hasn't cost any money. Very thorough review. We like to collect reward points and use them on vacation at exclusive hotels that we'd never spend the money to stay at. Sometimes it takes years. Thanks, Peg. I appreciate your comments. This is the first hotel review I have done on here, so I wasn't sure how much detail to add. The ptevious site I reviewed on wanted as much detail as possible. Very nice review of the Holiday Inn accommodation in Porto. I loved that you included photos of the hotel and its many features. Looks like a nice place to stay. Thank you, Mary. I appreciate you reading and commenting. We have also stayed in many Holiday Inn Express hotels. In the past I have tried in my articles to write a little background about the brand history (which I find interesting) and, in this case I also wrote about the benefits of the brand loyalty scheme. But, in order to get the article featured I had to delete both. Maybe these sections were considered too spammy. To be fair I would try to do similar for any brand, as I find the research into the history interesting and I think readers should be advised about loyalty schemes that help them to access a good room rate. Liz, this is a very good review. We now know well the Holiday Inn Express in Porto. We have stayed in Holiday Inn Express when driving through the U.S. and also in Canada and we have always been happy with the good size room, the bathroom and the breakfast. Nothing fancy but all the amenities you need are there. Holiday Inn is a good global brand. I always think that you know what to expect when you stay in one of their hotels as they have brand standards. 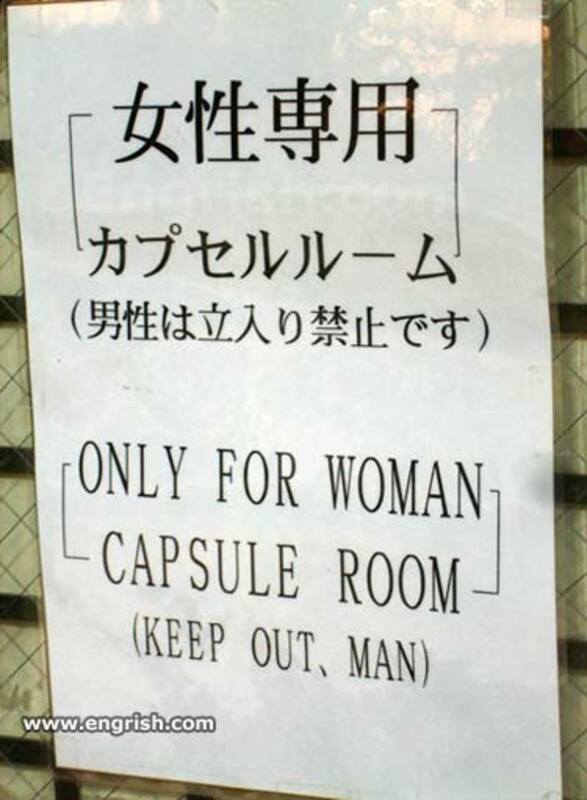 It is very unusual to have a small reception area. 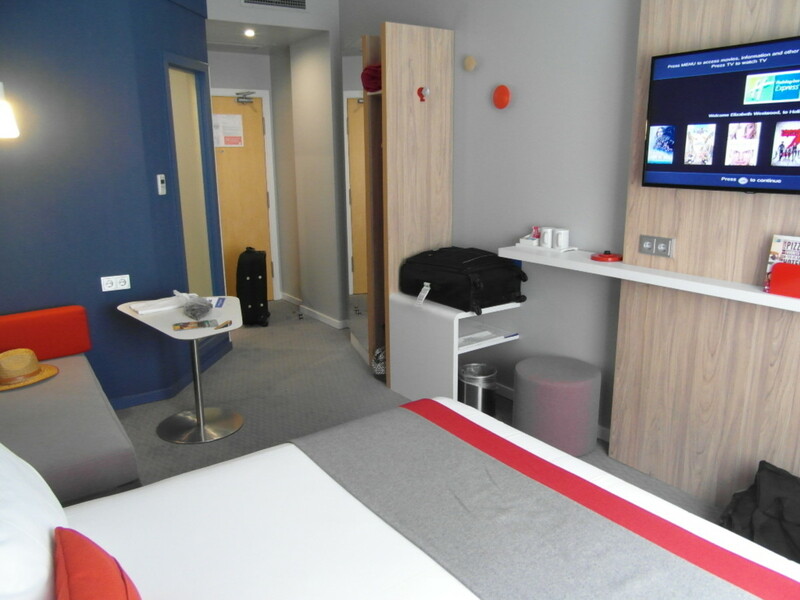 Holiday Inn Express hotels often go for an open lobby area and Holiday Inns in the UK are also adopting this. The reception area was a good size in Porto as it was open plan and flowed into the bar, seating area and dining area beyond. I have only come across one small reception in a Holiday Inn in the UK and you are right, it spoils the hotel. First impressions are important. Great review here! Holiday Inn is one of the best places to stat. I was able to stay in Holiday Inn Miami, Florida two years ago and the place was so wonderful. Their shuttle service, internet connection, and other facilities were really excellent! Not to mention the food was great too! The only complain I guess was the receiving area. It was so small, just like a small room. Is it the same in this area? Thank you for your comment, Gregory. 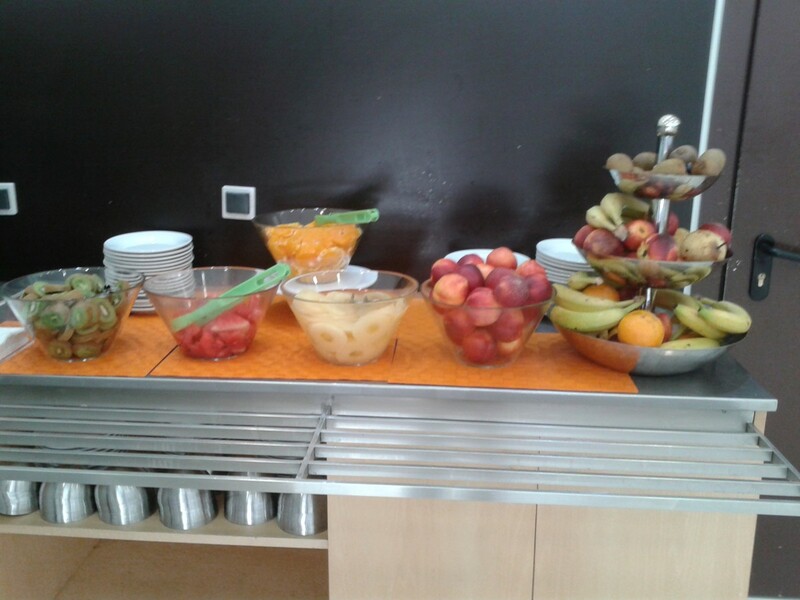 Breakfast at Holiday Inn Express Porto Exponor was better than in some higher standard hotels. Good idea about the coat hangers. The only problem was that the hanging space probably would not have held more than four. I also prefer not to live out of a suitcase, but here it was a trade off for a good deal. We have a Holiday Inn Express at the Homestead Waterfront here in Pittsburgh. It is right next to a Steak ‘n Shake. Your photo entitled “Breakfast drinks” reminds me of the cafe at the Giant Eagle where I grocery shop at the Waterfront. As a matter of fact, I was there earlier today. The breakfast selections look fantastic. Could you have requested more hangers? Four would not cut it very well for me. Plus, I don’t like living out of a suitcase. Thank you for your comment, Dora. As a child, our holidays were always camping and I dreamed of staying in hotels. So I hope I never forget how to appreciate hotel stays. Thanks for sharing your room and everything else. I love your appreciative attitude throughout your stay. Your tips are very helpful. Thanks for the encouragement, Ameen. Thank you for your comment, Natalie. My thinking is that you know what you are getting when you book a Holiday Inn Express hotel, as they have brand standards, which they have to adhere to. They also generally offer good value for money. My map capsules were deleted from this article and I now realise why, given that Google are now charging for them. I have stayed in many Holiday Inn Express hotels around the country and have always found them to be clean with good amenities. The usually have a good selection of rooms and their suites have always provided the room and features that I have needed even for long stays. Thanks fot your comment,Afroditit. 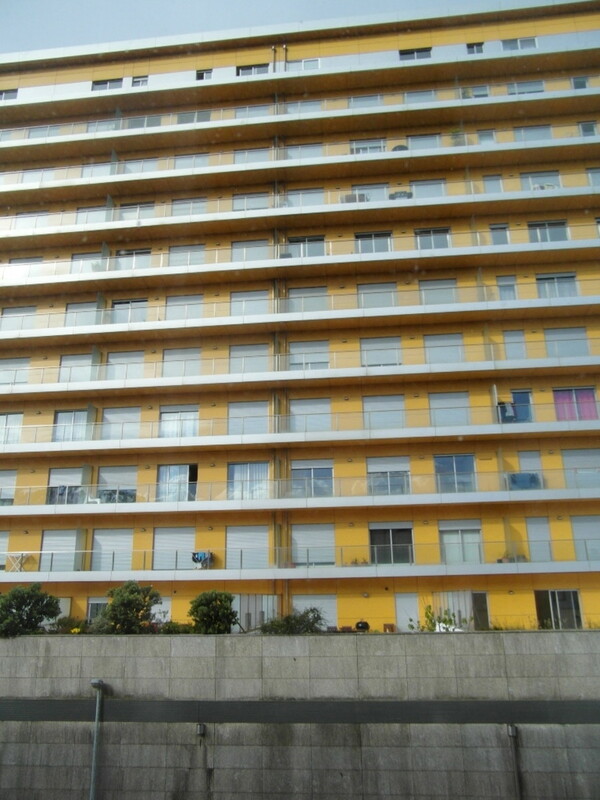 This hotel was a good base for us to explore the Porto area. Very nice article and great photos! 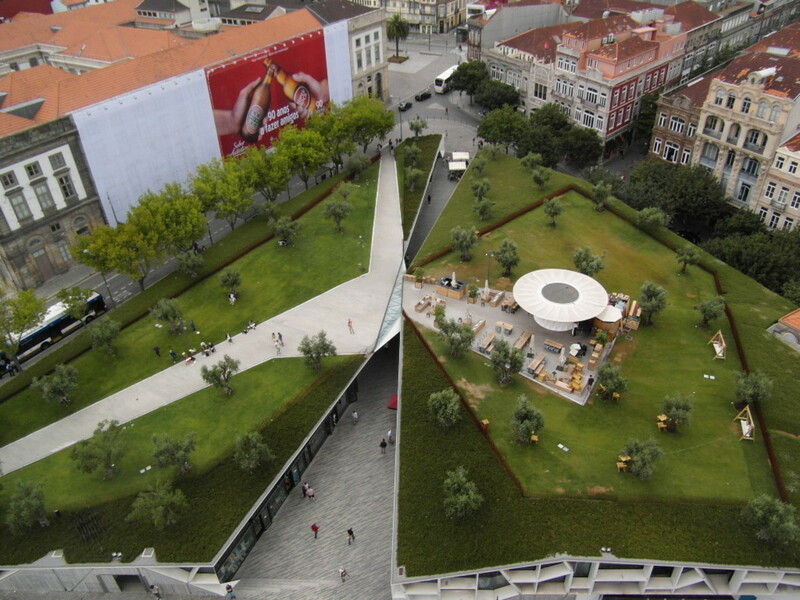 I would love to visit Porto and stay in this hotel! Thanks for your comment, Krzysztof. I'm grateful for any tips on how I can improve it, as this is the first hotel review I have written for this site. I'm happy you had a good stay. I liked that you included so many photos of the location, it really helped put things into perspective. It looks like a new-age version of the US Holiday Inn Express, and its location sounds great for the price. Thanks for your comment, Peggy. It was more modern than some I've stayed in in the UK. Are the Holiday Inn Express Hotels in the USA very different to this one? You certainly gave a good review of this Holiday Inn Express in Porto. I have stayed at some of these hotels in the U.S. and they are a good value generally speaking. Yours looked very modern.